January 3, 2104 Update: One of Roger Julkowski’s former students provided information about Julkowski’s year in Dekalb, Illinois. During the 1971-1972 school year, Julkowski’s landlord reportedly caught Julkowski with a student – and the police caught Julkowski urinating in public. This misconduct occurred approximately four years after coach John Gagliardi and Dunstan Tucker had Roger Julkowski removed from Saint John’s University. Roger Stanley Julkowski graduated De La Salle High School in Minneapolis in 1956. He graduated from Saint John’s University in 1960 and received a masters degree from the University of Detroit in 1962. 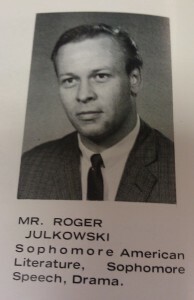 Yearbooks confirm that Julkowski was a teacher at the University of Detroit during the 1962-1963 and the 1963-1964 school years. 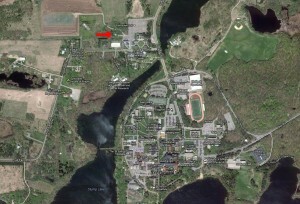 Other faculty members, including John Gagliardi, also lived in Flynntown. 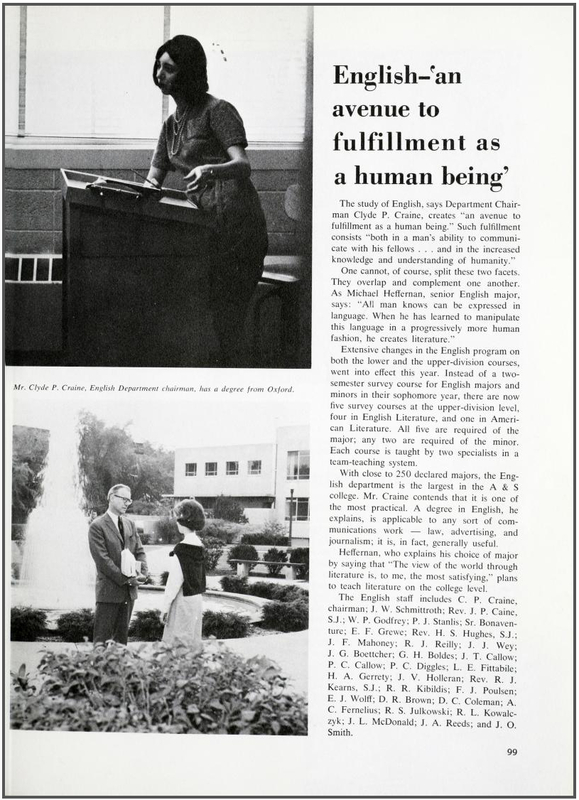 During the 1965-1966 school year, Julkowski was faculty advisor for the Sagatagan, SJU’s yearbook. Julkowski had taken over for Father Hugh Witzman, who held the position for only one year. 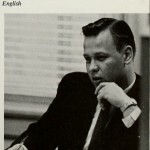 To the left is a photo of Julkowski from the 1966 SJU yearbook. He is listed as an English professor. When and why Roger Julkowski left Collegeville in the mid-1960s is still unknown. 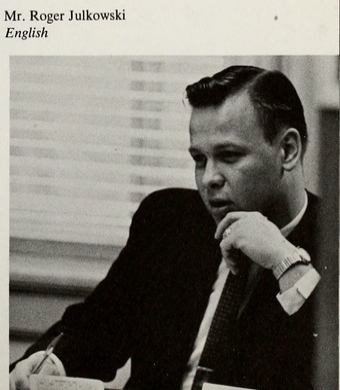 According to one of the students who worked on the yearbook in 1966, Julkowski “left abruptly”. Julkowski lived within walking distance to his job as an English professor and yearbook advisor. Why would he leave? Here is the most plausible explanation: In a conversation with two of his former football players on July 23, 2012, Saint John’s football coach John Gagliardi shared details [ View ] regarding an incident of sexual misconduct that he remembered having occurred in the 1950’s. It is more likely that the incident occurred in 1966 or 1967. The 85-year-old football coach recalled showing a recruit from Florida around campus when another faculty member known to Gagliardi offered to complete the tour. The next morning, Gagliardi found the recruit on his garage floor. The young man told Gagliardi what the faculty member did the night before. According to John Gagliardi’s account, he reported the incident to Father Dunstan Tucker, Dean of Students at Saint John’s. The lay faculty member, according to Gagliardi, was fired immediately. Father Dunstan Tucker was Dean of Students from 1958 until 1967. Gagliardi told his two former players that the lay faculty member went on to teach at Cretin High School. In the late 1960s, both institutions were primarily staffed by religious: Saint John’s by the Benedictines, Cretin by the Christian Brothers. A review of yearbooks, campus directories and phone conversations with former faculty members of both institutions provided no other matches. 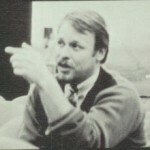 As stated above, Roger Julkowski reportedly began teaching at De La Salle in 1967. He had graduated from De La Salle in 1956. 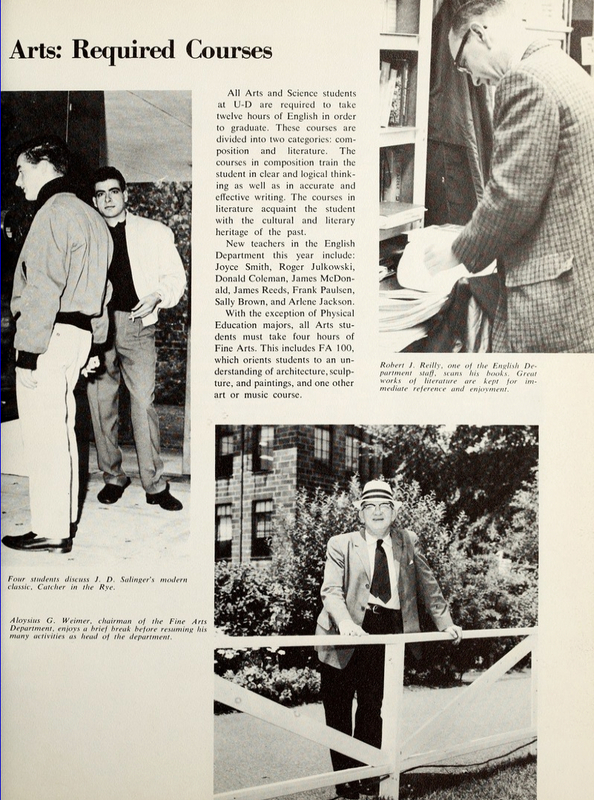 According to the 1968-1969 De La Salle yearbook (left), Julkowski taught American Literature, Speech and Drama. Julkowski taught at De La Salle until the spring of 1971. A former colleague believes that Julkowski was the victim of budget cuts. Former students shared details of parties at Julkowski’s place near Jax Cafe in NE Minneapolis. One De La Salle student even mentioned his three years of booze and beer parties at Julkowski’s house — and trips to The Farm — in his yearbook blurb. In the fall of 1971, Roger Julkowski joined the staff at Dekalb High School in Dekalb, Illinois. According to a former student, Julkowski appeared on the front page of the local newspaper during the summer of 1972 after he was arrested for urinating in public and did not return to Dekalb. The former student also reported that Julkowski’s landlord walked in on Julkowski (in his underwear) and one of his students. In the fall of 1972, Roger Julkowski joined the staff at Cretin High School in Saint Paul (MN). 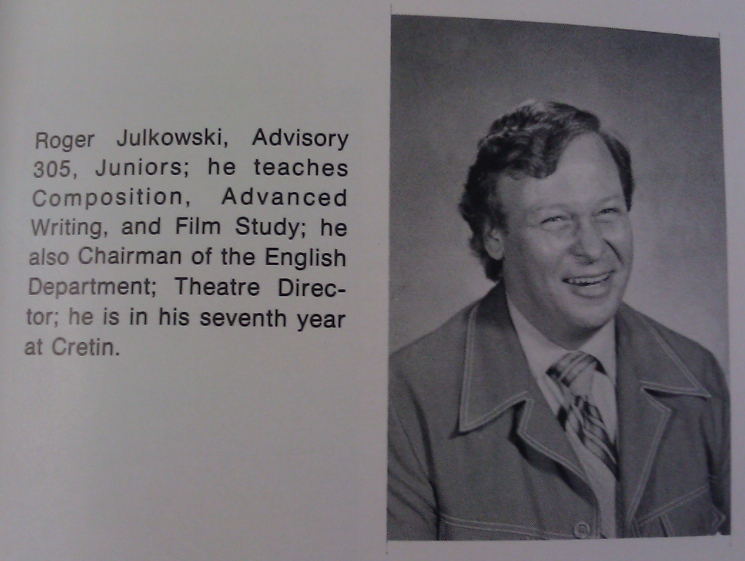 Seven years later, in 1979 [ View Photo], Julkowski was teaching Composition, Advanced Writing and Film Study. He was also the chairman of Cretin’s English Department and the school’s theater director. A former colleague at Cretin remembers that Julkowski had a place in the Twin Cities but often went home to Flynntown on the weekends. In 1981, Julkowski was forced to leave Cretin. According to a former SJU student (and friend of Julkowski) Julkowski claimed that a “misunderstanding” with a student led to his dismissal from Cretin. 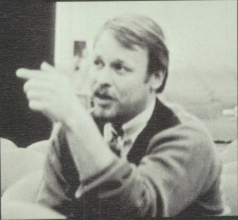 Campus Ministry / VISTO In 1982 or 1983, Roger Julkowski returned to work in Collegeville, Minnesota. He worked in the mail room at the Liturgical Press, shared an office in the campus ministry office with Father Nicholas Doub, ran the VISTO (Volunteers In Service To Others) program, and was an occasional eucharistic minister at the both the upper and lower abbey churches, the same churches frequented on Sundays by the Gagliardi family. The brother of a former SJU student provided the following account regarding Julkowski’s via email in 2007. During the summer of 1984 [Victim] was visiting campus for the day to do some studying of native plants when he ran into Julkowski. It was getting later in the day and Julkowski invited [Victim] to stay with him in Flynntown instead of driving back to his hometown, 60 miles away. [Victim] was a very trusting and a down to earth person and would have never thought twice about accepting this invitation. After dinner, they talked awhile and Julkowski showed him up to the room he would stay in. [Victim] went to bed and a short time later he thought that the guy’s dog had crawled into bed with him until he got closer. At that point [Victim] jumped out of bed, turned on the light and asked him what the hell he was doing. Then [Victim] saw the jar of Vaseline and realized what Julkowski’s intentions were. [Victim] grabbed his stuff and got out of there as fast as he could. According to the April 18, 1986 SJU Record, the VISTO program at CSB/SJU had over 850 members. On at least one occasion, Julkowski was reprimanded for loaning out the VISTO vehicle to students who used it for non-VISTO purposes. The VISTO car and Julkowski’s house (and his barn) were not the only carrots Julkowski dangled in front of prospective targets. He also had money. One student, and frequent visitor to Julkowski’s home, accepted a loan from Julkowski to cover his tuition. In the late 1980s, Julkowski asked the student to come up to his bedroom. Julkowski claimed that he did not feel well and asked the student to sit on his bed so they could talk. The student recently described a painting above Julkowski’s bed depicted an older man in a reclined position, fondling a naked young boy. As the student sat on the bed, Julkowski’s grabbed the student’s arm and attempted to pull him on top. The student resisted the advance and left the home. Soon after, the student began to distance himself from Julkowski. He never returned to Julkowski’s home. Like a jilted lover, Julkowski began stalking the student, demanding that he repay the loan. It was obvious to the student that Julkowski was drinking again. The student distanced himself from Roger Julkowski, and by late 1989, had moved several states away. In a recent phone conversation, the student, now in his late 40s with strong ties to the Catholic Church, recalled a dream that he had on the evening of October 22, 1989. In the dream, Roger Julkowski abducted a young boy and did something with the body in West Gemini Lake, the lake behind Julkowski’s home. On the morning of October 23, 1989, the former student heard the news that Jacob Wetterling had been abducted in Saint Joseph, Minnesota, a few miles from Julkowski’s home. On March 30, 1993, Roger Julkowski died at his home in Flynntown. His death certificate says that he died of natural causes at the age of 54, with the “immediate causes” listed as hypertension and alcoholism. A week before he died, Julkowski called a family member to say goodbye. The family member said that Julkowski had become despondent in the weeks leading to his death and simply stopped taking his medication. According to another family member, there was no alcohol in the house when Julkowski died. Rumors persisted for years that Julkowski had been diagnosed with AIDS and others heard that he hung himself. Family members are adamant that a ruptured aneurysm took Roger Julkowski’s life. According to a family member, Julkowski didn’t show up for work at the Liturgical Press one morning. Saint John’s Life Safety personnel reportedly went into his house and found Julkowski on the floor (according to one family member) or one his bed (according to another). In both cases, Julkowski’s dog was by his side. The family sold Julkowski’s house and gave way or burned most of his belongings. Several people have shared stories regarding misconduct by Roger Julkowski. It is unlikely, however, that all of his victims have come forward. It is quite likely that one or more victims have reported misconduct to Saint John’s. A few years ago, an official from Saint John’s called one of Julkowski’s relatives to report that allegations had been made. Why didn’t Saint John’s make Julkowski’s name public a few years ago? Because personnel at Saint John’s knew that the allegations were credible and making Julkowski’s name public would shine a light on Julkowski’s past — and Saint John’s decades-long knowledge of, and culpability for, his propensity of offend. Getting Help If you have knowledge of misconduct by Roger Julkowski or any other personnel at Saint John’s, please contact law enforcement, a therapist or an attorney. Also feel free to contact the webmaster [ Go ] .